Today I’m answering the questions for the last week of the Truthwitch Read-Along hosted by he Waterwitch Babes including Charlene (Bookish Whimsy), Olivia (The Candid Cover), Kim (Dreaming in Libraries) and Carine (Ceres Books World). I’m a little late to posting this time around (as the read-along technically ended on the 29th), but I still wanted to share my thoughts so…haha. If you want to learn more about the Truthwitch Read-Along be sure to check out Charlene’s blog Bookish Whimsy. Also if you’re interested in reading my answers to the previous weeks, feel free to check out my posts on week 1 and weeks 2 & 3. Just as warning some of the questions and answers contain spoilers so just be aware of that if you haven’t read the book yet. Week 4: Chapters 30 to the End. 1. What do you think of Leopold now that the book is finished? Do you think we will see him again? I’m definitely more interested in him as a character. His twist in the book definitely took me by surprise and now I’m wondering about the true extend of his powers/character and who might also be connected to him and what his role will be going forward in the novel. So, yes, I definitely think we will see him again. 2. What are your thoughts about Iseult and the Puppeteer? What do you think could happen in the next book for them? I’m thinking a possible showdown (but maybe not in the next book?). I kind of figured out that the Puppeteer was the one speaking to her early on, but it wasn’t necessarily a bad thing that I did so. I mean it was a little obvious that Iseult is probably a Void witch because Aeduan can’t smell her blood and added to her connection with the Puppetteer and the whole Cahr Awen thing and it seems to scream that she is so. I’m very interested to see who the Puppetter actually is. Susan does a great job of setting up new storylines and suspense into the next book so I’m excited for an eventual showdown between the Puppetter and (hopefully) Iseult. 3. What do you think of what happened in the end with Kullen, or with Safiya? Well we know what happens with Safi pretty much. It will be interesting to see how she handles her new role as prisoner/adviser and how the separation from Iseult will change both characters. I’m not sure what happened with Kullen, but I’m hoping that Ryber is on her way to him and that he’s actually okay or able to survive the cleaving. Maybe Iseult (with possibly the help of Safi and the Wells) will be able to eventually reverse the cleaving (since she apparently might have the ability to actually do it)?? Idk wishful thinking on my part? 4. Tell me five words to describe Truthwitch? Loyal friends fighting for goodness. 5. 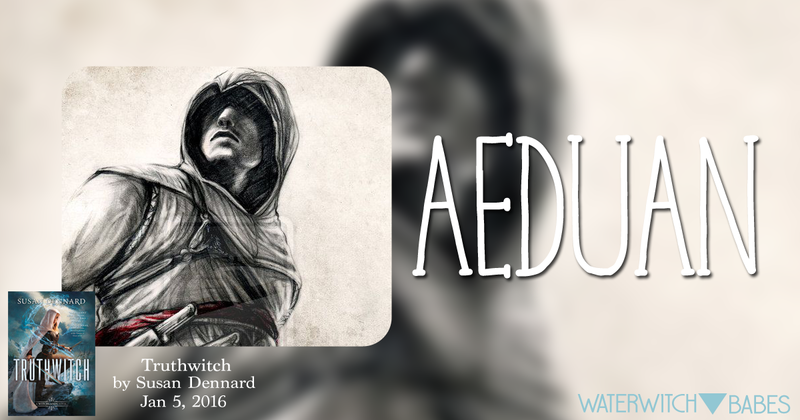 Character Spotlight: Aeduan / As you know I love Aeduan, what do you think of him? Do you think he will change his plan now that he knows the truth? “Mhe verujta” means trust me as if my soul were yours. I like this quote. Do you think that Iseult could trust Aeduan? After reading more about Aedun, I’m definitely loving him more. I think I’m being drawn to him a little more than the other male characters because he’s a complicated character. The romance lover in me just wants to reach out and be like “no, you’re so much more than you think you are!” and “duh you and Iseult would so be good together cause you’ve both dealt with the whole world hating you and you’re both trying to prove something even if you both won’t admit it!” So yeah I definitely ship Iseult and Aeduan even if it’s not possible lol. I’m really hoping that Aeduan doesn’t turn all bad. I’m hoping his “villain-ness” doesn’t last in the end. I feel like there is a lot left to unpack from him and I can’t wait (and really hope we get to!) to do so throughout the rest of the series! These questions came from Cere’s post here.